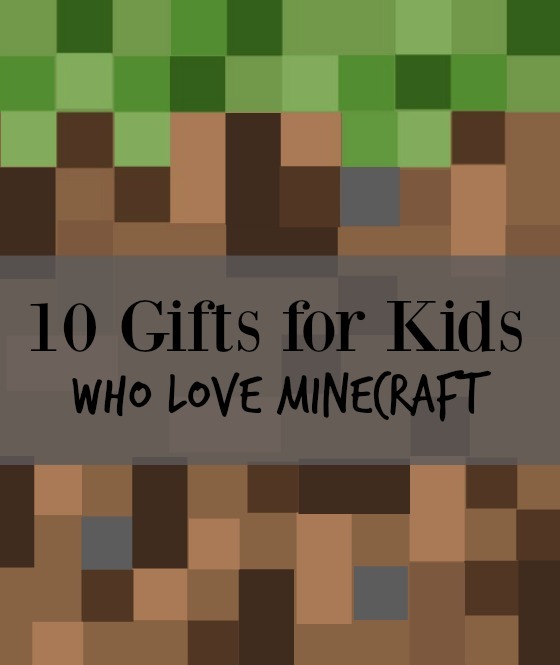 At a glance: 20 super cool Minecraft gifts for kids, some you can buy and some you can make! The toy bins at home are overflowing with toys that were barely touched. Staring at an aisle of toys you know will have the exact same fate makes gift shopping less fun than it should be. Whether it’s Christmas shopping or birthday presents, the perfect gift is one that will be loved and treasured… and used. At our house, anything with a little Minecraft flare has the best chance. Is the same true at your house? Don’t miss our super practical (but still fun) stocking stuffer ideas. This post contains affiliate links. Thank you for supporting Confidence Meets Parenting. There is a good mix of really cool Minecraft gifts that will have your kids excited to stop playing the game… for a few minutes anyway. Minecraft Stop-Motion – This one would work great as a joint gift. I can totally picture M and M working together to create Minecraft Stop-Motion Animation. Diamond Block Night Light – How cool is this Minecraft Night Light? It even shuts off automatically! Minecart Papercraft – Big M got the Minecart Papercraft for his birthday. He had a great time putting them together and setting up Minecraft scenes. Creeper Hoodie + Diamond Hat – What a fun way to stay warm… and look cool! The Minecraft Creeper Hoodie and the Minecraft Diamond Hat. Wall Torch – This Minecraft Wall Torch is such a cool bedroom accessory! Minecraft Handbooks – There are 4 of these books and they act as a resource. You can buy them in a set but all the ones I’ve linked here are the updated version. I did not find the updated version in a set. Minecraft: Combat Handbook , Minecraft: Redstone Handbook , Minecraft: Essential Handbook , Minecraft: Construction Handbook. Blockopedia – Minecraft: Blockopedia is another resource guide. It has great reviews! LEGO + Minecraft – We have a few of these. Surprised? The LEGO Minecraft Crafting Box allows for builders to create 8 different scenes. Minecraft Stuffed Animals – I could not resist! You can buy a Minecraft Plush Set or pick the favorite. The Minecraft Chicken Plush has been a loved buddy at our house. Creeper Shoes – These creeper shoes from Candace Play Forth look easy enough for even a non-crafter to make! Minecraft Pillows – My little ones would love to snuggle up to one of these no-sew Minecraft pillows from Surviving a Teachers Salary. And if you like to sew, these would make an easy sewing project. Creeper Plush – I love that this stuffed creeper from Marmalade Forest is oversized! You will need a few sewing tools for this one. Minecraft Deskset – If you have a little one who loves working at a desk AND loves Minecraft, these DIY pencil holders from Red Ted Art will be perfect! Dirt Block Sugar Scrub – I bet this Sugar Scrub from Halle Cake would make an awesome party favor or stocking stuffer! DIY Torches – Simple, fun pretend play has always been a winner at our house. These Minecraft Torches from Twitchetts look like so much fun. Crochet Animals – If you have a little crochet know how (or want to learn), give these adorable Minecraft Crochet Animals a try. Fabric Blocks – Another easy crafting project that could be done as sew or no-sew. I could see these fabric Minecraft blocks from Making a Life being used as decoration… or as a fun toy. DIY Swords – More pretend play! YAY! Diamond swords, like these from Twitchetts are a must have for any Minecraft fan. Wall Block Art – Surprise them with a new Minecraft Pig from Bright Star Kids or collect all the supplies as the gift. Then create the wall art together. Make sure to pin this post for when it’s time to start shopping! Thanks for this. My 6 yo son and 9 yo daughter love Minecraft, and this helped enormously.